Yesterday, the markets headed higher. My Dynasty Portfolio, consisting of 21 stocks, was all In the Green. This is indicative of what we wrote on Sunday regarding the historical precedence of this sort of volatile trading action – one day up big, the next down hard, with sentiment changing mid-day, at times. In terms of tightening periods, this has been the longest on record, yet the FED is still signaling that it might be another year, before it stops raising interest rates, with other central banks, the ECB, and the BOJ, not even in the game yet, when it comes to tightening on their own. so that might last many more years. In other words, this global QT (Quantitative Tightening), which is a giant liquidity squeeze, still has legs. Remember, we started from the bottom, so even though interest rates have risen dramatically, in the bigger picture, our corporations can definitely withstand these levels of debt and interest payments. Governments, on the other hand, are not enjoying themselves, believe me. They are paying higher rates on the debt, without raising taxes and without cutting back on social programs, accordingly. Something will have to give at one point, and I see big devaluations for major fiat currencies in the coming decade. Many investors have greatly criticized the number of share buybacks, done by CEOs of companies during this bull market, with 2018 being a record year using this strategy. 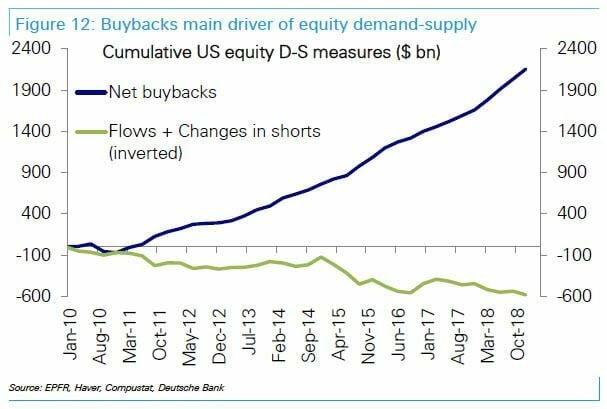 So, I want to explain, in simple terms, why share buybacks are being executed in such vast proportions and to show you the contrarian view of this issue. The alternative media believes that buying back shares resorts to trickery and inflating profits, on a per share basis. Put differently, they attribute the bull market’s long track record to this “fake” buying. Here’s where Wealth Research Group has a different view of this nationwide tactic, used by hundreds of top-level management. CEOs can use profits to do five basic things: pay down debt (if there is any), pay a dividend to shareholders, buy back shares, make acquisitions, or invest in the internal growth of the business, if it is required. Many of the biggest and highest-quality companies in the world have insignificant to non-existent debt. They also have been raising dividend payments by either single-digit or double-digit pace for years on end, so this hasn’t slowed down for them. Several have been making acquisitions, but I remind you that the overwhelming majority of management teams have failed miserably, during the lifespan of post-war Corporate America, to make sound and profitable mergers, so that doesn’t make me that excited. The point is, though, that CEOs haven’t been neglecting these strategies. Shareholder funds, hundreds of billions of them, have gone to money heaven, due to bad acquisitions, so not doing them, is a net positive for America, it seems. Most companies, on the top-notch sphere of the S&P 500 or the Dow Jones 30, have been investing heavily in the internal growth of the operations. In fact, the world’s 3rd largest company, Amazon, is famous for putting all of its profits back into the growth of the business. Other tech and traditional blue-chips have put enormous sums into staying competitive, yet they are so well-run that even after all of this, ungodly cash sums remain at the disposal of the CEO. Apple Inc., for example, is sitting on $250B in cash! Throughout this bull market, we’ve seen these highly-paid leaders, who make tens of millions of dollars every year, make conscious decisions to decrease the number of shares outstanding, by buying back from the public billions of dollars’ worth of shares, with the excess cash hoards. What CEOs know best is their own company. Therefore, if they are under the impression that the company’s trajectory is to keep growing and to become even more competitive, deploying cash to buy back shares helps long-term shareholders more than anything else. When you own, as an individual, a portion of a company and the amount of shares is decreasing, your percentage in the ownership increases, by default, without your involvement. In other words, you are gaining equity, TAX-FREE. Your dividend payment goes up, by definition, since you own a bigger slice of the profits pie. Again, this happens without any intervention on your part. 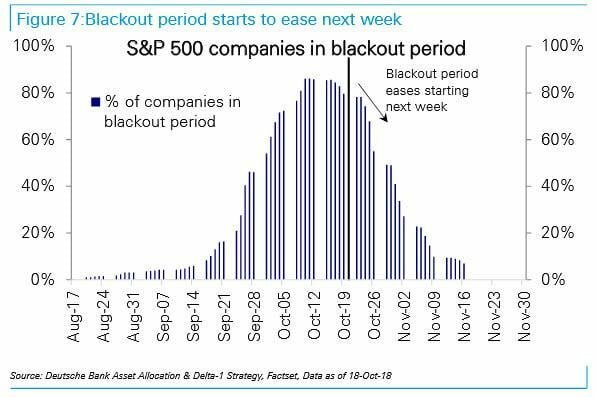 As you see above, due to earnings season, companies have not been able to do buy backs (Blackout period), but the October sell-off has created a situation, where CEOs can get aggressive and purchase more of them, now, when they’re cheaper, which the best ones will do. Buying back shares is an opportunistic endeavor, not an automatic trade. In other words, the best CEOs do this, according to the value of the company, compared with its price. 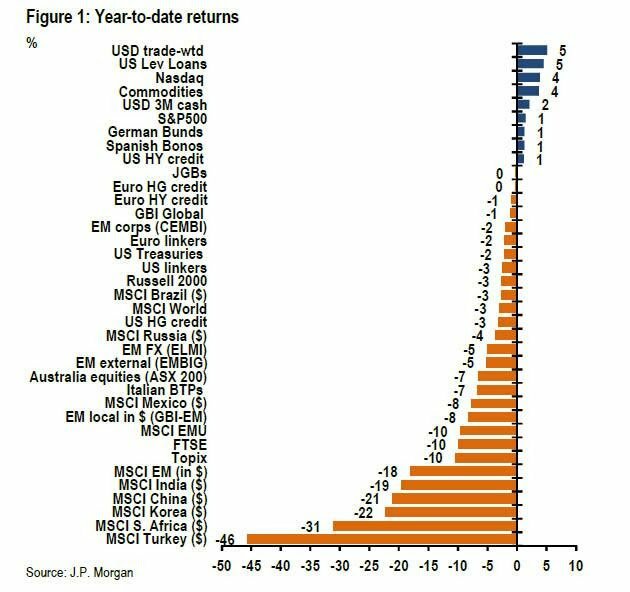 In 2018, the best-performing asset, thus far, has been the USD. Similar to what you saw in 2015, the markets were flat for close to a year, before rallying. Taking a breather is a healthy part of a bull market. Remember, in the long-run, you are an investor, which means that your goal is to own an EVER-INCREASING equity position in the growth of the global economy, by focusing on the businesses that (1) you understand and (2) are able to become more valuable. Don’t bite the hand that feeds you. CEOs are not committing a mistake by buying back shares. Among them, there is the rotten fruit, those who do this for the wrong reasons (inflate their personal results-based compensation) or those, who do it erroneously by buying back, no matter what the price is. Avoid both of these types and stick with the professional ones. 3 secrets the greatest investor of all times has revealed to us all.